Yeah, but: A disposable price that doesn't need disposable batteries. 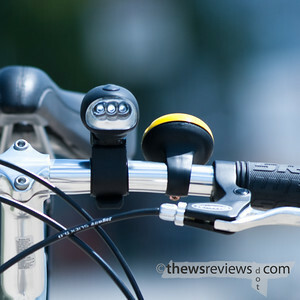 The Long Version: I have a thing for lights, and a thing for bike accessories. I also have a thing against buying batteries - small, recurring costs bug me. 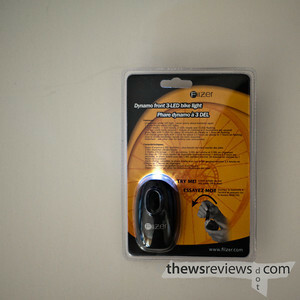 So when I found this little hand-cranked dynamo bike light, I knew I was going to give it a try. I haven't been using it long enough to have a good sense of the durability of the Filzer Dynamo, but it seems well-built and has a nice and slightly grippy surface. The light itself is modest with a blue tint, which is good for making the bike visible at night, but isn't going to light the cyclist's way. Personally, I like my lights bright enough that they help my visibility during the day. Canadian cars and trucks have their lights on all the time, and if it helps a six-fool-wide multi-ton vehicle get noticed, I don't see how it can hurt skinny little me. Mountain Equipment Co-Op sells this light for $8.75. It's hard to beat that price, especially since it has a built-in rechargeable battery. So the fact that it isn't the brightest bulb isn't really unexpected. It's far, far, far better than nothing, which is exactly what it's likely to replace for most bikes. If the batteries run down they can be fixed faster than a flat tire. For more serious lighting needs - getting my arse hit by a car is an ongoing concern of mine - I'd suggest getting a brighter battery light to use in combination with this one. When I have the second light I can foresee adding a diffuser material to the Dynamo to increase its visibility from the sides. One of the interesting things about the three LED dynamo light is that it feels really nice to hold. It has an oval profile, and the crank handle folds back into the body when it's not in use. Frankly, it makes a pretty decent flashlight for general use, and it's so cheap that there's no reason not to have one around. Ah, if only it was that easy. The Dynamo light comes with a really big caveat: the batteries self-discharge, and if they're allowed to stay discharged, then they won't hold power any more. If that happens, then this eco-friendly fossil-fuel-free-transportation-enabler is heading for the local landfill. That's got to be the height of counter-productive irony. It also means that this can't just be put in a glove compartment or emergency kit until it's needed. You'll also need to take it off the bike and occasionally crank it while the bike's in storage over the winter. No problem, of course - as I mentioned before, it does double duty as a flashlight... except that the streamlined shape that's so comfortable to hold makes it too bulky to put in anything less than a coat pocket. 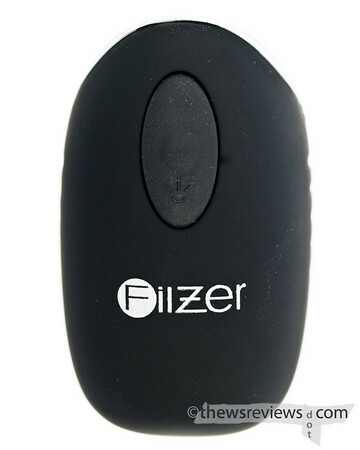 The Filzer 3-LED dynamo is a good light: not the brightest, but not the most expensive either. Every bike should definitely have a light, and if the care and feeding of the dynamo sounds acceptable, then there's no reason why it shouldn't be this one. Riding an unlit bike is inexcusably stupid when there's such a cheap and serviceable light on the market. The Two-Week Update: Some additional use has shown me one more trait of this light. I still consider it to be a decent-if-modest light, but I've noticed that it rattles. Not much, and not loudly, but it bugs me. I may be over-sensitive, but now when I know that I'm not going to be riding during or after dusk, I'll leave it at home or carry it in my bike bag.